Money is a bit tight…well not really. I’m just a bit cheap. I have been using a purse for the last little while that is falling apart. At first I didn’t care but it got to the point that I was embarrassed by it. So I decided I needed a new one but I didn’t want to spend the money on it. I thought I’d do a bit of stash busting and selected some fabric left over from a mantle I made. I didn’t use or make a pattern. I just winged it as I went along. And I cut the rings and clips off of the old purse. I’m not loving how it hangs…I made it too wide. Apparently you can have too much space in a purse. For now it will do until I can find a purse I am willing to cough up real money for. Then it will serve as a carry all. It is hard work to be a lady! 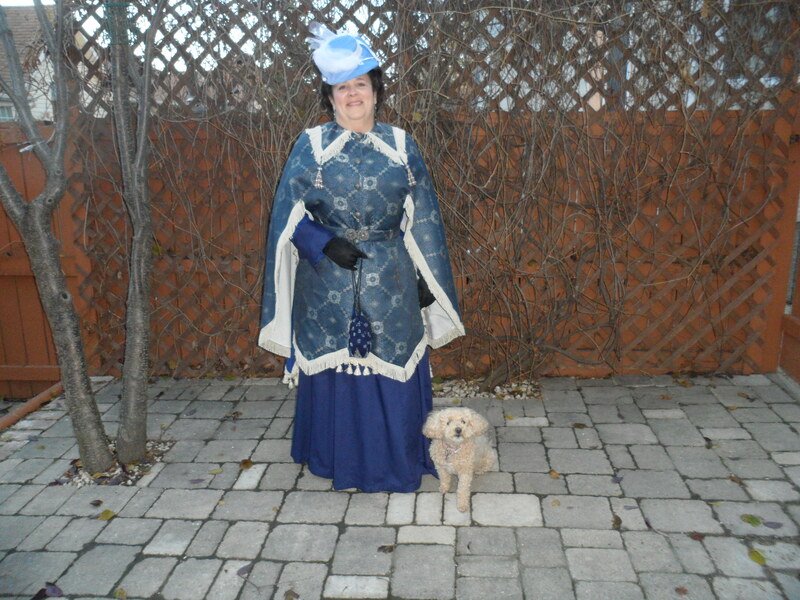 Shirley and I decided to be like a real Victorian lady who wore several outfits throughout the day. But before that, we had our little Christmas morning. I gave her the gloves I made for her. Then we dressed for a morning of shopping. We found an excellent deal at a fabric store. Shirley is getting hers measured out and mine is in the bag. This is my fabric. 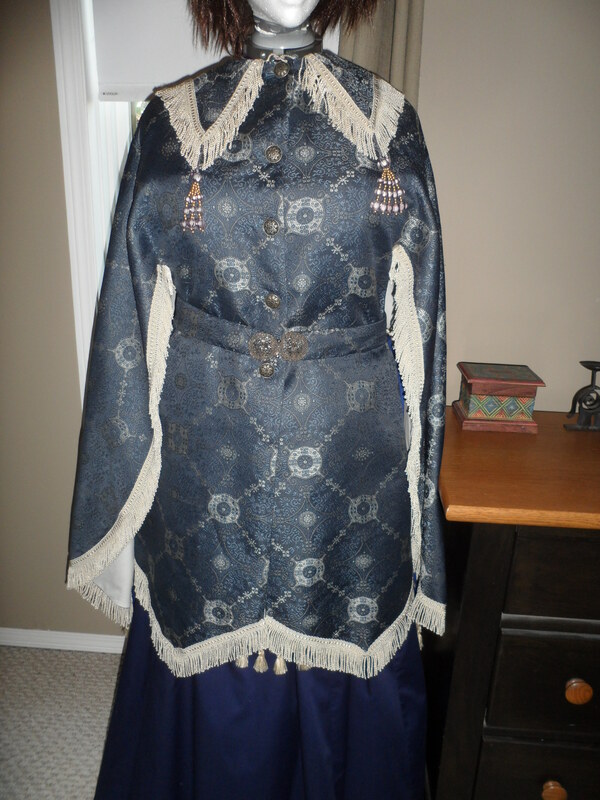 I think it will be a day dress for a more common woman in the 1840’s. There were some lovely photo ops all over the place. While walking around, I found this quote and I think it suits me just fine! We went back to our hotel at lunch time and the sun in the window made a lovely photo! One for Shirley and one for me. 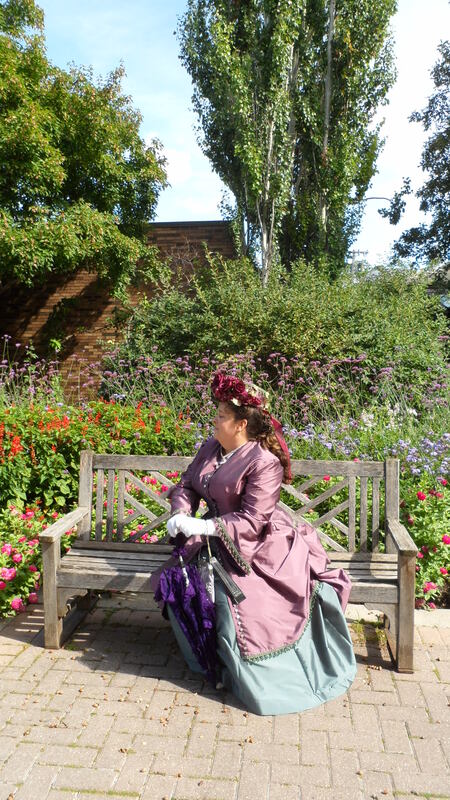 After a quick meal and a very Victorian rest we got ready for the afternoon. As you can see by my taped shoulder, I am the walking wounded. We went to the local church for a high tea. 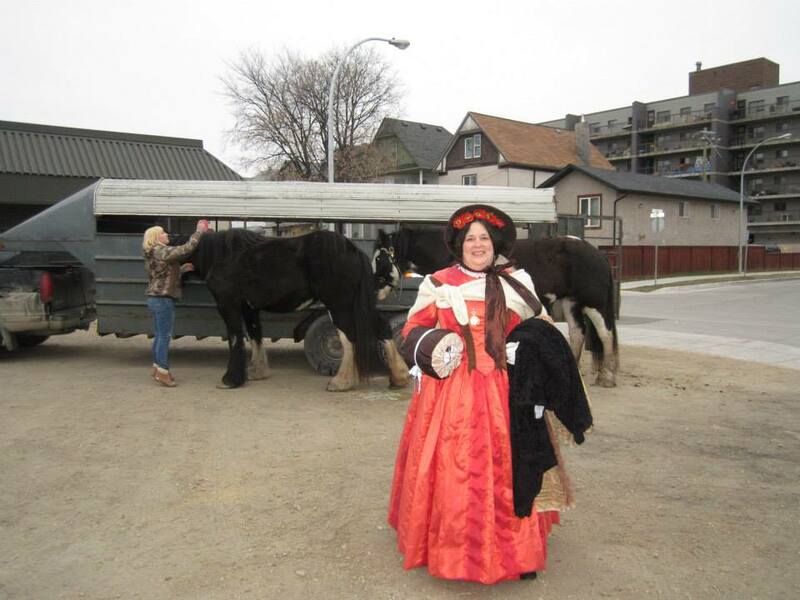 And then enjoyed a carriage ride. 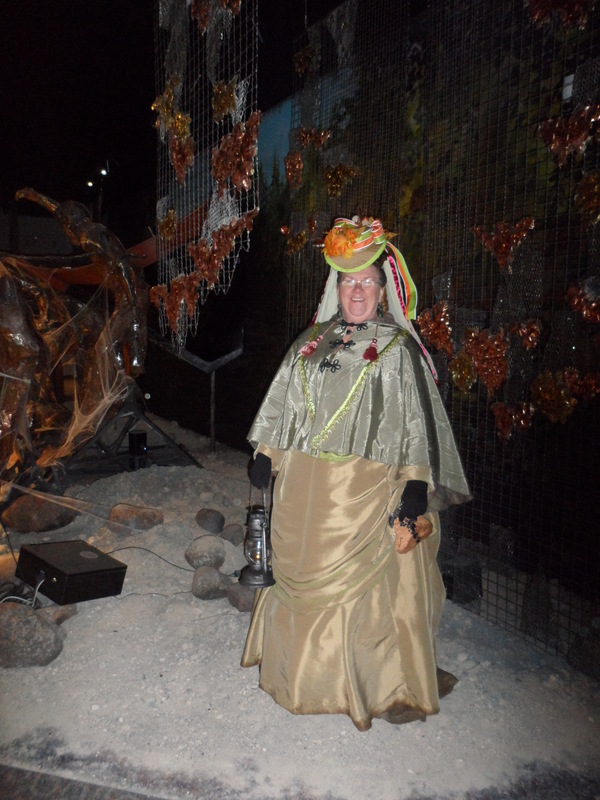 Then it was back to the hotel to don our evening wear. Isn’t this the prettiest outer wear! I wore my Green Queen dress. The Queen and her Lady in Waiting. All in all, an excellent time! 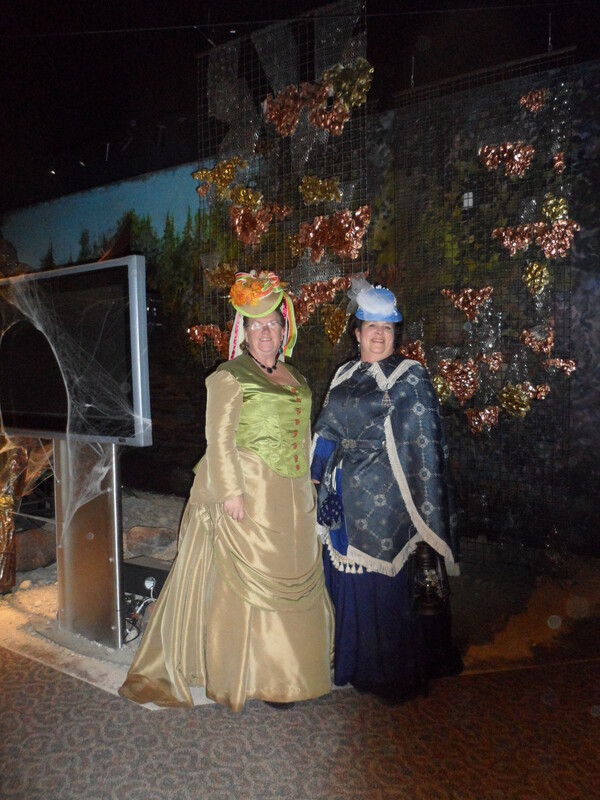 Shirley and I went to Lower Fort Garry for their Halloween Fright Night event. It is great fun but there is almost no light so taking photos is hard. 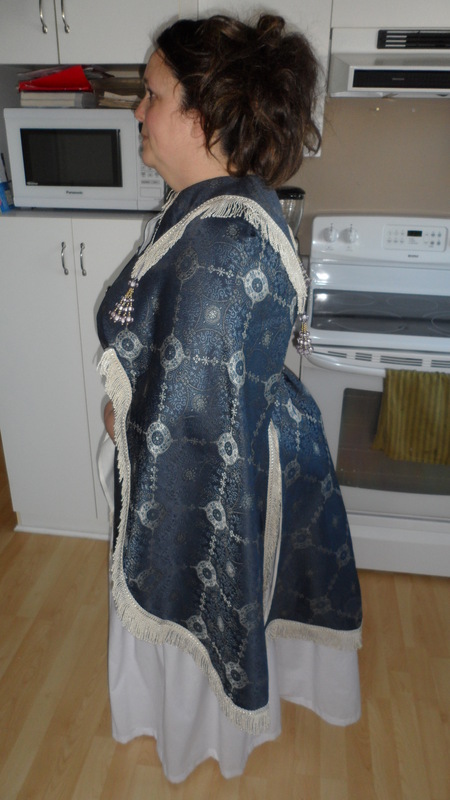 Since I was wearing my new ensemble, I had hubby take photos at home in the day light. I showed you the front view in my last post. 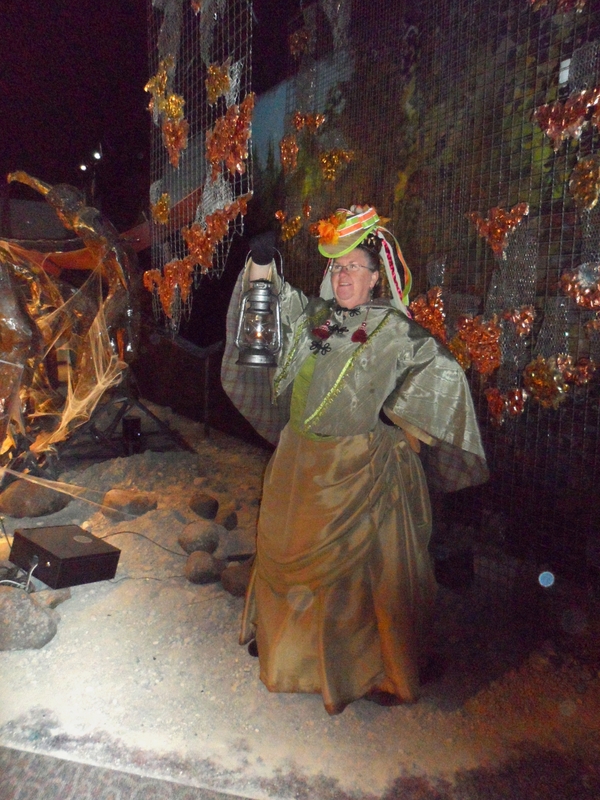 Here is the front view with the hat and my star bag…. I’m lovin’ the side view. It makes me think this is my new favorite! This is the other side with the hat. These are some of the accessories I chose to wear. Note: some of them are from the gift I received a couple of weeks ago. I loved wearing them! The only place to take photos was in the modern welcome center…and even there the light was not ideal. Shirley and I found another visitor who was willing to get a photo of us together. 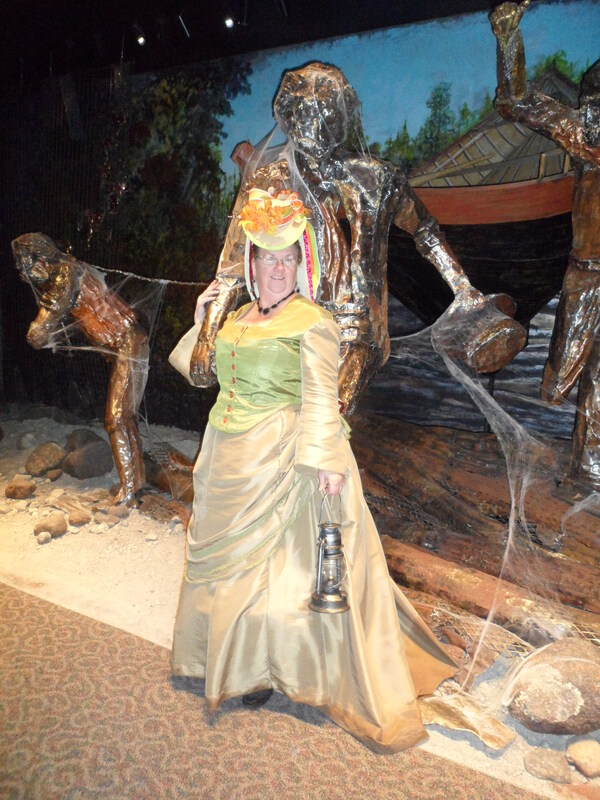 Shirley is in her newest 1870’s dress as well. Here are some of the best shots of her dress. There is a statue representing the fur traders that came to this area on York boats and Shirley and I got a bit silly with it. What the item is: belt buckle-steal cut. Possibly Victorian but probably Edwardian. The Challenge: soft entry for Heirlooms Challenge. The mantle it is on was made many moons ago. But when I was given the buckle I thought it was perfect for the mantle I made. This challenge seemed the perfect time to put it on. Year: Mantle 1871. Buckle: Possibly Victorian but probably Edwardian. How historically accurate is it? 70% The mantle is 1870’s pattern made with synthetic fibers. The buckle is likely Edwardian. I have no proof that they used buckles on this style of mantle. Sorry for the lousy photo. The lighting sucked. This was the best angle in my little room. 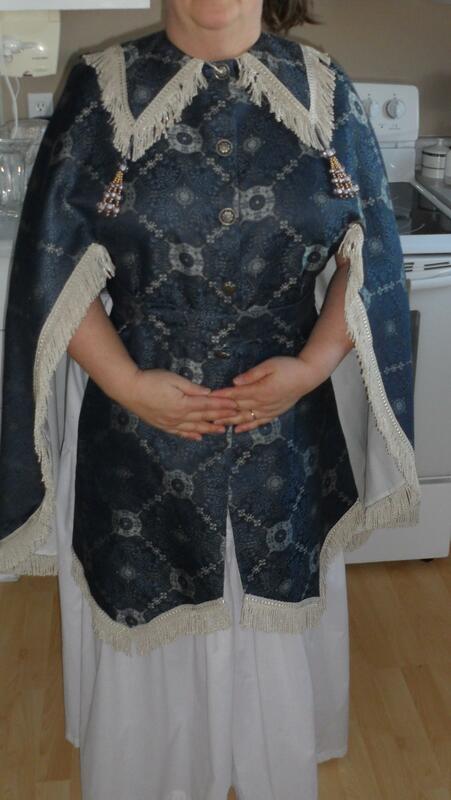 Also, this is very plain but I may add some trim once the bodice and over skirt are done. Hopefully, by that point, I will have a name for this new outfit for the mantle. What the item is: under skirt. 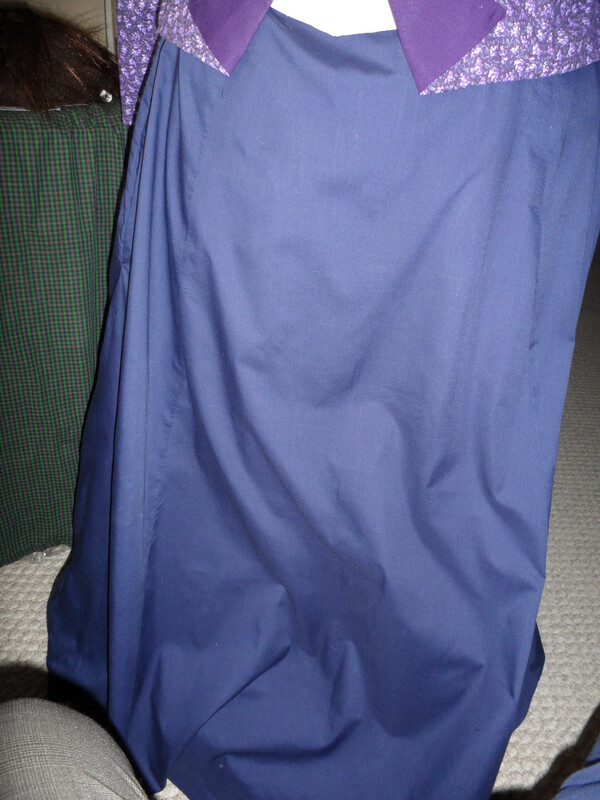 A dull under skirt. Very utilitarian! It was made to fit the challenge and to go with the mantle I made two years ago and haven’t worn yet. 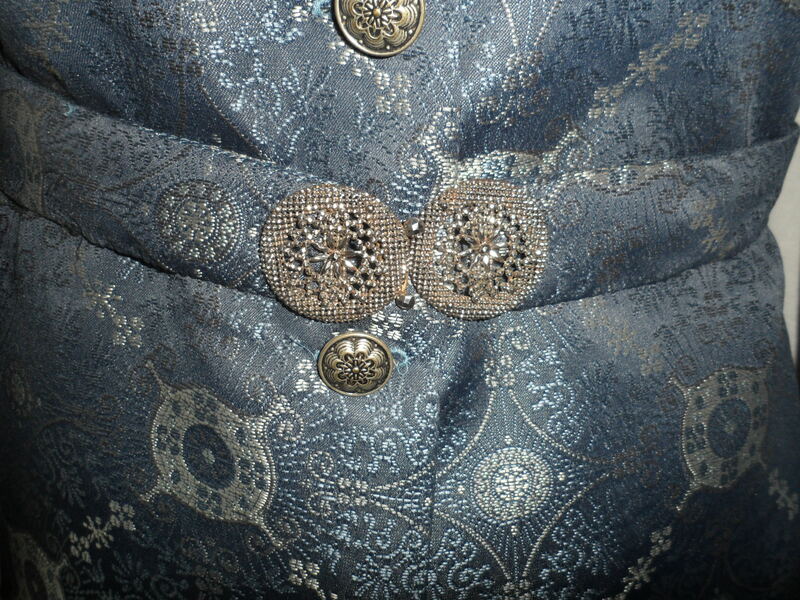 Notions: 2 buttons for closures. How historically accurate is it? I’d guess about 90%. 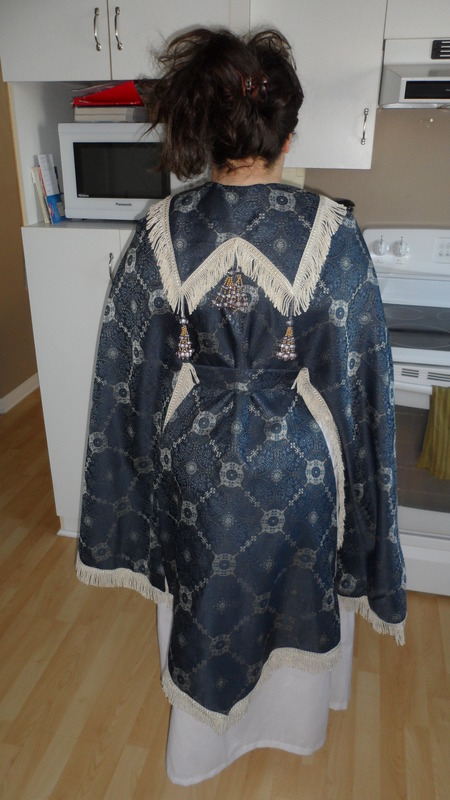 The buttons are modern and I can only guess if the weight, weave and dyes are correct. Hours to complete: 10-mostly hemming. It is a very easy pattern to whip up. 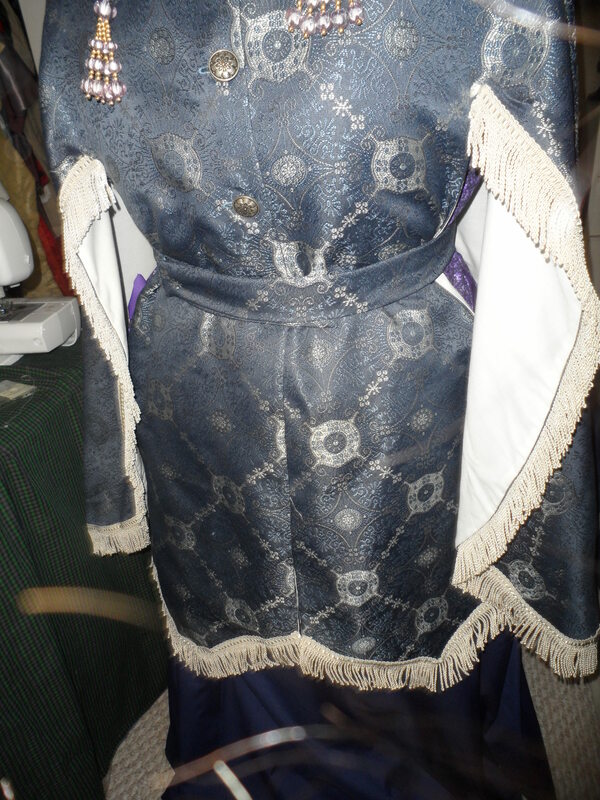 It doesn’t look to bad with the purple bodice. Options. Happy New Year! 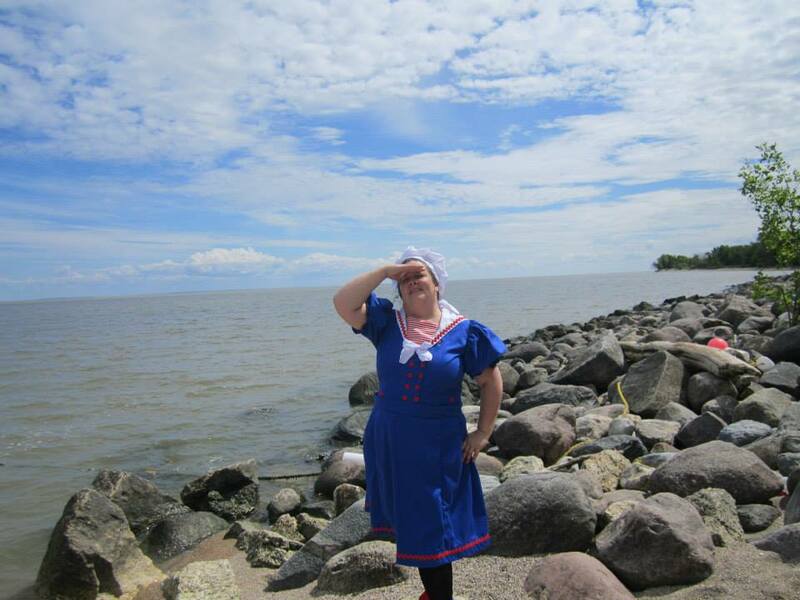 And as every sewing blogger knows, now is the time to reflect on how much we managed to get done. Wow! It is really amazing how much I got done once I got out of my slump and there is only 2 reasons I was so productive-Deadlines and Challenges. The vast majority of those came from The Historical Sew Fortnightly Challenges. 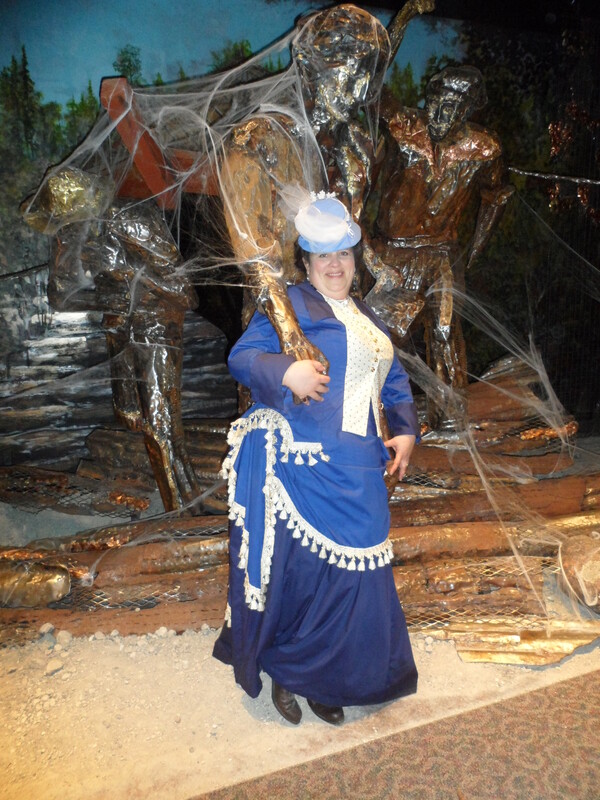 There was crochet fingerless gloves and an 1950’s costume for work. 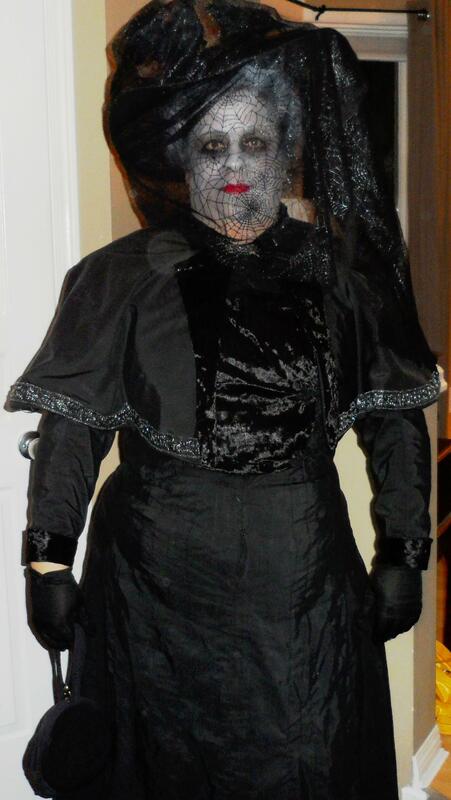 There was my 1900 widows weeds that includes a petticoat, skirt, bodice with hand-made frog closures, a serious hat and a “scary hat” for Halloween, and a cape. I’ve knit a modern scarf and a Victorian shawl. 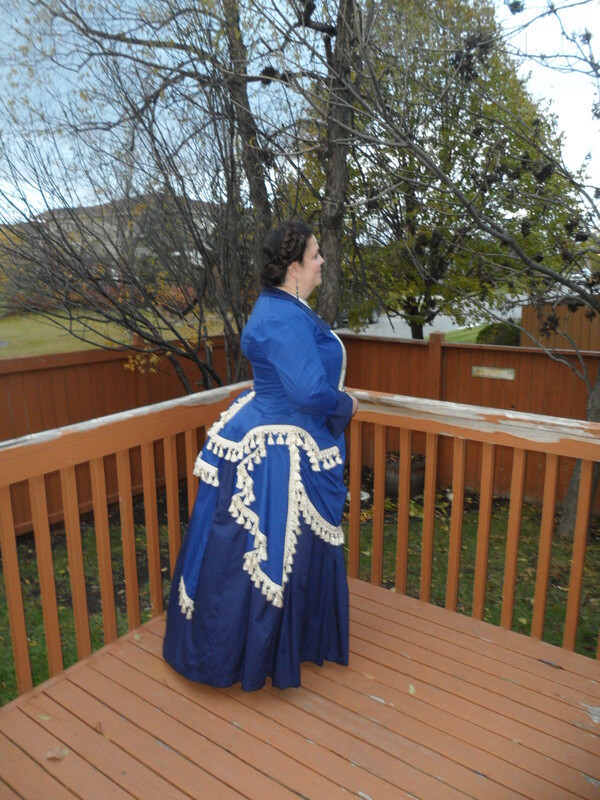 I have worn the shawl with my 1840’s Copper Penny dress and that includes 3 petticoats, the dress, bonnet, reticule, hand-made lace collar, and a muff. 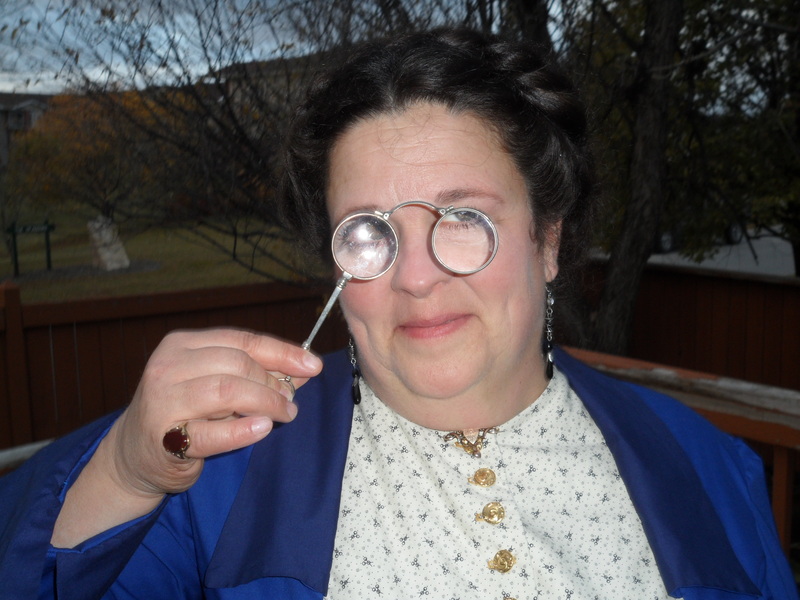 I upgraded a hat for my 1890’s walking suit and made several pieces of jewelry. 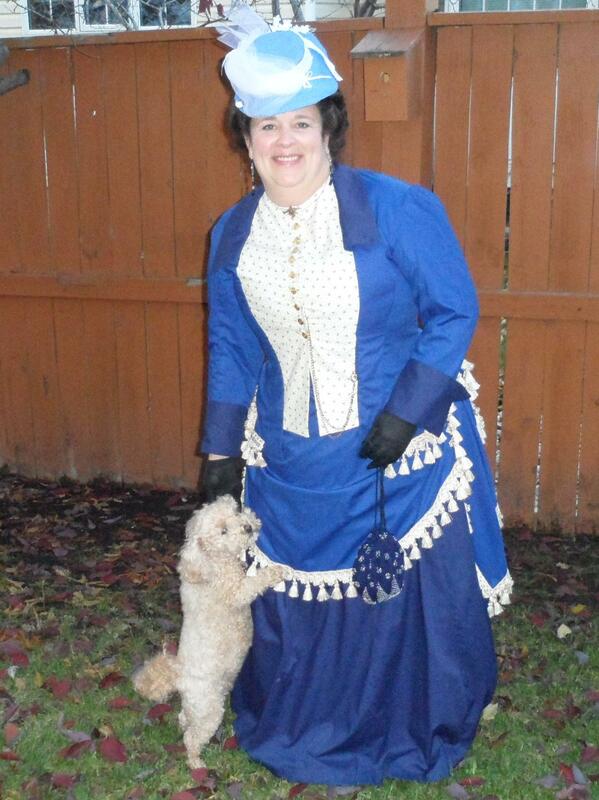 I made a complete 1890’s swim suit which includes the suit, the skirt, the hat and shoes. I’ve made my first corset and I’ve made a handkerchief to give away. 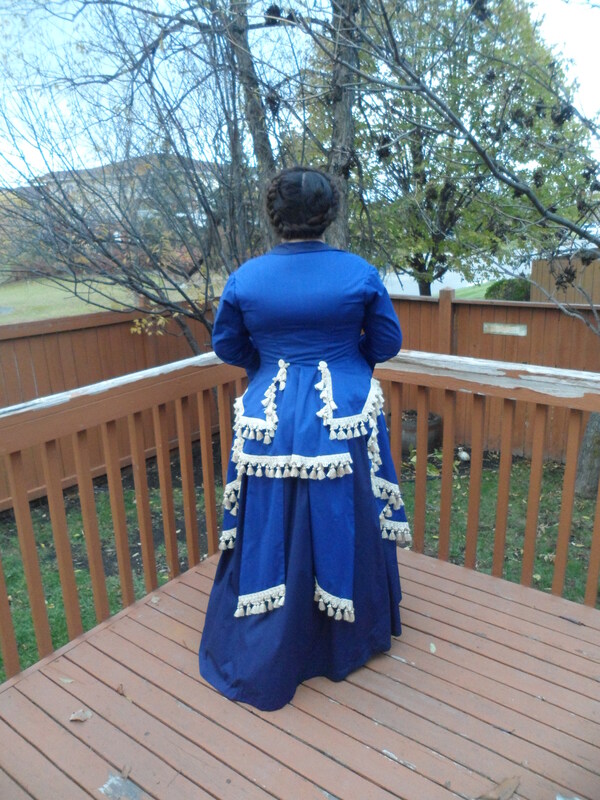 I’ve made an ugly 1880’s Tea Gown…twice. 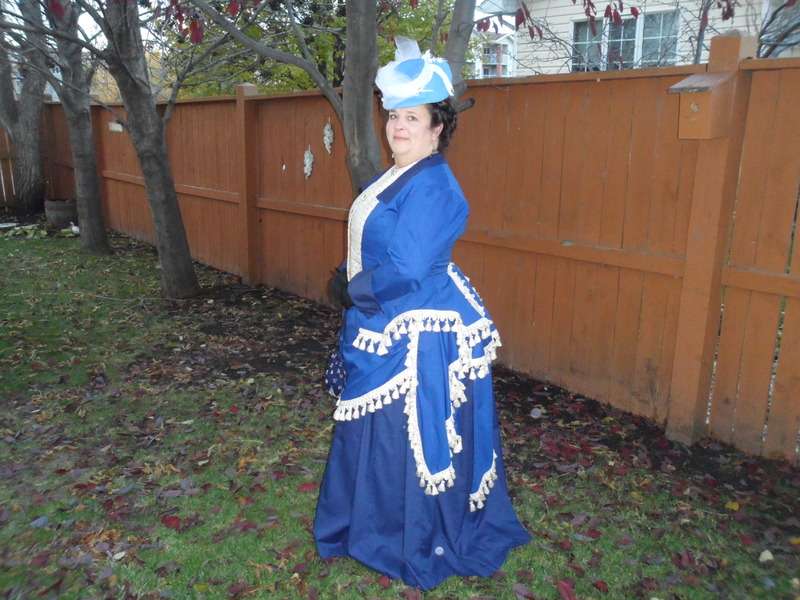 I’ve made my 1873 Polonaise that includes skirt bodice and hat. 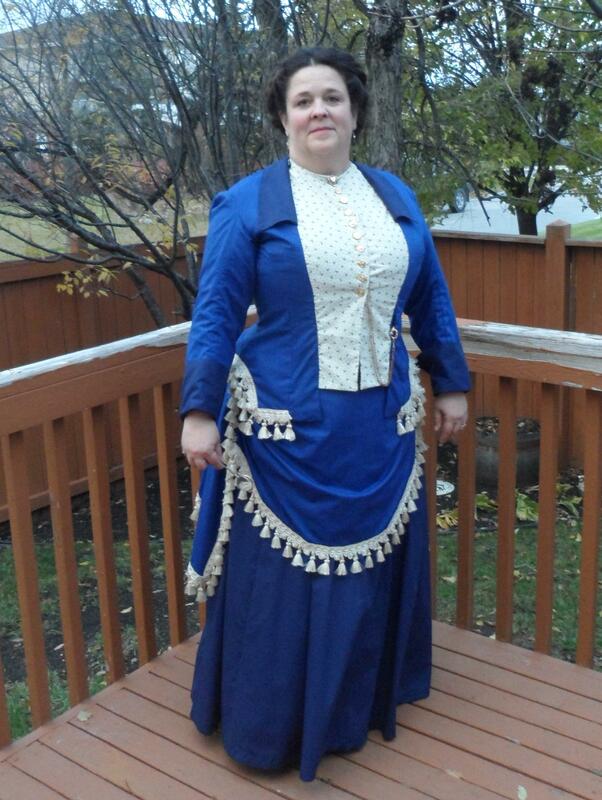 Now for the final challenge I give you my new 1870’s mantle (that may or may not be worn with the above outfit). Notions: buttons, trims, thread, hooks and eyes. How historically accurate is it? 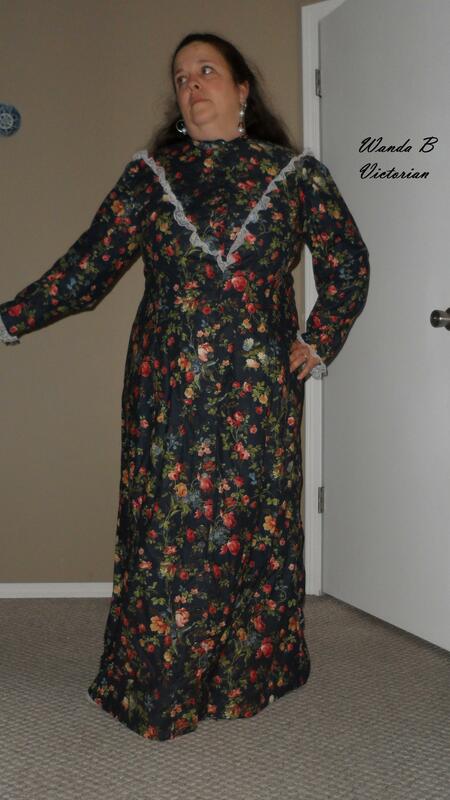 The pattern is accurate, the print is plausible to my eye, it is half machine sewn, half hand sewn which is plausible as well. The fiber content of the fabric is not. 70%? First worn: just for this photo.